Pioneer Oil just dropped off another load 187.1 gallons of heating oil on Tuesday. The previous delivery was on January 12th, and that was for 178.6 gallons. Our tank has a capacity of 275 gallons. Compared to 2013 we are 262.44 gallons over where we were last year at this time. Oil prices have changed little, but they are still high, $3.97 to $4.09 / gallon. This year we are a lot colder that we were last year. Our snowfall thus far this year has been 20 inches, and it was only 7.2 inches last year. Temperturtes have been much colder this year as well. This can account for the usage. 3.8 gallons a day since the last delivery is well within the expected norm, but I expected far less due to our vigilance, new boiler, and new Nest thermostat. No matter what we do to conserve, the weather puts up a good fight. If we did nothing we would loose for sure. I'm not complaining, just being observant. I can't wait for the insulation to be installed this coming fall. That will be a game changer. One thing I can say is that since the new boiler went in, and the new thermostat, we are not cold as we have been in the past. The boiler heats better, the steam is more abundant in the radiators as opposed to 30%, or more, flying up the chimney from the broken old boiler, and manner in which the house is heated is well controlled by that miriacle Nest knob on the wall. If all goes according to our 2013 history, we should have one more delivery in March / April, and then nothing till Fall. Before we put in the on demand hot water system we would get a delvery in June as well. Stay tuned. 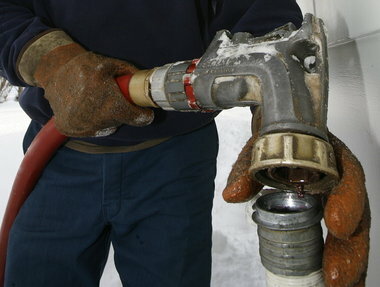 How are you doing heating your home this winter? Wally: Do not touch the new boiler, women do not do well in a cold house. How about leaving the cellar alone and checking the snow load on the roof. With all the water content, its got to be getting to the limit. Please use a snow rake, not the snow blower up there. Just a thought as I know you have to keep busy. Craig, snowblower is way to heavy to get up the ladder. Snow rake is going to get a workout tomorow. My house has two zones, upstairs and downstairs. Beside installing two Nest Thermostats, this year we closed all of the doors on the second floor and lowered the thermostat to 60. Doing so prevents the rising warm air from the first floor from going up into the upper rooms of the house. Previously, I could feel a cold draft pouring down the stairs. It wasn't an air leak, but rather displacement of the heavy cold air with the lighter warm air which was rising into the second floor. Close the doors upstairs, and the draft stopped. Downstairs, we closed the doors to the bathroom stopping any circulation of outside air from coming in or leaving from the ceiling ventilator fan. As I mentioned in a comment to a previous post, the simple changes I made really confounded Pioneer who delivers my oil based on degree days and 14 years of being their customer. They're always within 5 gallons of the established delivery point, it's uncanny how accurate they can estimate my need for oil. But the last delivery, they were off 40 gallons; forty! That's saying something for the Nests and are efforts to conserve. We keep our house around 65 in the Winter. My wife complains, but she doesn't write the checks for the oil. Upon arriving home in the evening, I get into my "warm and fuzzies", flannel pants and a Thinsulate sweatshirt, and I'm good. In an effort to keep my wife happy, I run a small electric heater in the family room where we watch TV. It use costs an estimated $.25 per hour to run; literally pennies to keep my wife happy. It raises our electric bill by $40 per month, but that's far less than it would cost if I were consuming oil. It's been a harsh winter, but I'm actually ahead of the game.